Genuine or fake? You decide. An image of what appears to be of a new version of Apple's Mac mini has appeared on various websites. This seemingly shows the back of the machine, which features five USB 2.0 and two display ports. 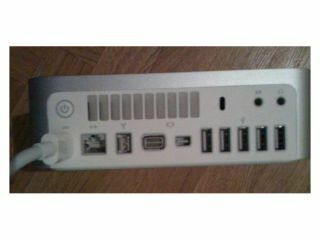 Unlike the latest iteration of the MacBook, there also appears to be a FireWire 800 port. Whether the photo is genuine remains to be seen, but if you want to believe that it is, you might also like to know that the person who originally posted it claims that the new Mac mini will contain an Intel Core 2 Duo 2GHz processor. 2GB of RAM (DDR III, 1066Mhz) is also said to be on the spec sheet, so there should be enough grunt for you to run most music software. Don't expect Apple to confirm or deny whether this is the new Mac mini, but if it is, we'd expect it to be among the new product announcements that some believe the company will make in March.